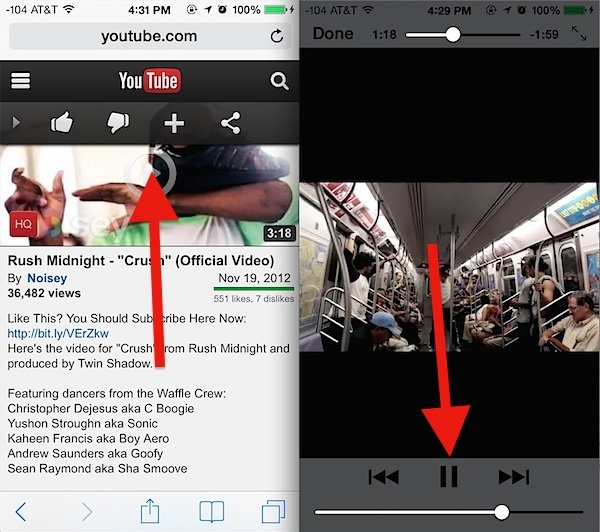 Playing YouTube videos and audio in the background of iOS is an easy way to listen to a song or show that you want to stream to your iPhone, but the ability to play that stream in the background has changed a bit with the newest versions of iOS. 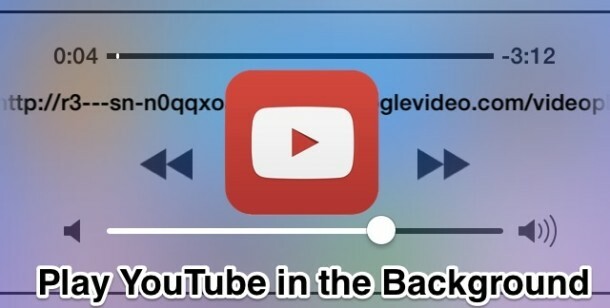 As many recall, users on the iPhone and iPad with prior versions of iOS used to be able to start playing a video or music from YouTube and then just switch out of the app to keep the audio playing in the background of iOS, but it’s not quite the same anymore. While you can continue to listen to YouTube video and audio streams in the background, you’ll have to rely on a slightly different method. 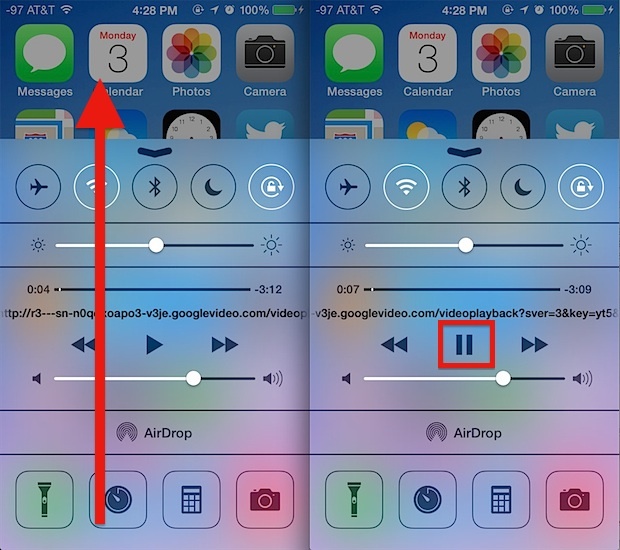 Forget the official YouTube app for now, because at the moment in order to play a YouTube video with audio in the background of iOS 7, you’ll need to use the Safari web browser instead, then you can trigger the audio stream into the background from Control Center. It sounds more confusing than it is, and after you do it once or twice you’ll get the hang of it rather quickly, so follow along to learn the new backgrounding process. That’s all there is to it, the YouTube audio will continue to play until the video itself has finished playing. If you’re doing this on an iPhone that is not connected to wi-fi, the video will stream using the cellular connection instead. That includes starting the video on wi-fi, but using Control Center to start the stream in the background later when away from wi-fi. Just be aware of that, since streaming video and audio can be heavy on the bandwidth usage. Unfortunately, YouTube Playlists don’t seem to be supported, so if you want to hear another video you’ll need to go back to Safari and start to play it again, then use the Control Center trick to again start the audio stream. It’s not entirely clear why the YouTube app doesn’t have native support to play audio in the background of iOS, though it first occurred when the Apple’ provided YouTube app disappeared. Presumably this is a limitation from Apple since most other apps also do not allow background audio either, suggesting this is not a feature that Google intended to leave out of the native iOS YouTube app. At least there’s a workaround, even if it’s not perfect. This works the same with YouTube in Safari for iPhone, iPad, and iPod touch, running any version of iOS beyond the 7.0 release. Enjoy. This also works with the YouTube app Jasmine. Haven’t tried it with playlists but it definitely works with lockscreen/background. What about jailbreaking your phone and use the native yt app in background? Podcasts works to background audio, Music works to background audio, why doesn’t YouTube? Maybe they didn’t implement the feature? Of course Google removed it. They want your eyeballs on their app> their ads. And they don’t want to make the iphone too good. Think about it. Anyway, as above, there are a ton of YouTube background players. Just a shame you can’t access your playlists/account. I discovered this by accident while watching my friend’s band’s first television performance on David Letterman off of the Facebook app (via youtube). I got in the car and SURPRISE it started playing over bluetooth while locked and in my pocket. We have an iPad mini and an Android tablet in our household but both wont videos play in the background with the Youtube app, so I’m guessing Google did leave the feature out. YouTube in control center is working but it’s showing only the play/pause button there. Nothing for rew/fw. What happened with those two buttons <> in iOS 9? I used them to start the song again in my car.